This is a portion of what the Chicago River looked like Saturday morning. St. Patrick’s Day weekend always draws raucous crowds and jubilant celebrations throughout the city, and the festivities got underway on Saturday with the dyeing of the Chicago River. If you couldn’t make it downtown for the big event, don’t fret. NBC 5 Chicago has a recap of the ceremony at the top of this page! 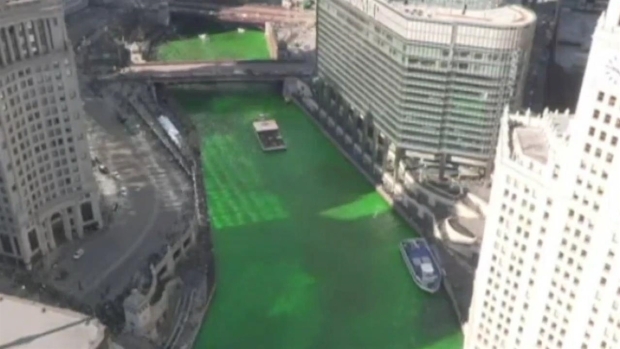 Watch in less than 20 seconds of the Chicago River being dyed green for St. Patrick's Day on March 17, 2018. The annual tradition kicked off early, beginning at 9 a.m. on Saturday. Crowds gathered along Wacker Drive from Chicago to State Street for the popular event, as Chicago Plumbers Union Local 130 workers turned the river a beautiful shade of green for the big day.